Most users bought the shoes because this vintage footwear was very popular in the early 1990s. Several reviewers love the Reebok Pump Omni Lite as they look good on foot retaining their chunky with white, navy and mesh sections balancing its all-white look. Quite a lot noted how the shoes are well-crafted and well-built. A large number of buyers note they bought the shoes because this was also the pair they used when they started playing basketball. Majority of the basketball players using them are pleased with the Hexalite cushioning as they are extremely comfortable on the court. Majority of those who bought these shoes are fascinated by the perfect fitting shoes. A few bought these pairs as part of their basketball sneaker collection and not for actual court play. A good number of wearers noted the basketball kicks break-in easily. A couple of observers noted that the shoes do not easily get dirty and when they do get dirty the kicks are easy to clean. Serious sneakerheads love these iconic kicks in their collection because it is Reebok’s most popular basketball shoe of all time. Some reviewers are worried that the shoes’ leather material show signs of creasing and are less supple. A couple of buyers suggested looking at the shoes personally in stores as some colors and a puffed out tongue do not come out the way they look online. An online commenter criticized this new release of the Reebok Pump Omni Lite as its pump air release system and cushioning are no longer what they experienced before. Several complaints were posted on the failure of the pumps to work as they do in the past. A few users observed shoelaces are a bit short. A shoe collector noticed that the Omni Hexalite System in the recently released models is tougher and less responsive than earlier models. The Reebok Pump Omni Lite continues to attract another generation of basketball sneaker fans in their recent retro releases. Since it was released more than 25 years ago, it has remained consistent in what it can offer basketball sneaker fans. After all, this is not just any ordinary shoe but iconic basketball kicks that went popular in the early 1990s by giving shoe making giants like Nike and Adidas a run for their money. The Reebok Pump Omni Lite was originally launched in 1989 but it was only in 1991 NBA slam dunk contest that it got noticed by sneaker fans. Boston Celtics point guard Dee Brown won the slam dunk contest wearing this iconic shoe. In his signature “No Look Back” dunk, Brown wowed the crowd during the competition by adjusting his Omni Lite’s pumps before doing the stunt. This seemingly new technology of the Pumps at that time sparked a generation of basketball fans who have considered this footwear trendy and advanced. Since then, Reebok began releasing retro versions of the shoe and collaborated with a few retailers such as Lemar Dauley, Basquiat, size, BSTN, and Bape for unique colorways of the iconic basketball kicks. This latest version of the Reebok Pump Omni Lite released in 2017 is designed with the classic silhouette updated with modern styling. In terms of style, the newly released 2017 version stayed true to the mid cut re-work of the Omni Zone II sneakers of the late 1980s. 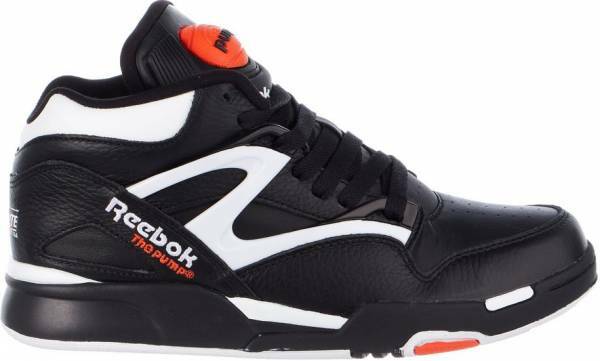 Instead of toying with the black and white colorway that Dee Brown wore, Reebok in its latest offering used a white, black with washout orange detailing. The shoes also used premium and synthetic leather all throughout the upper finishing with a warm off-white color for the leather upper to give the shoe that vintage look. In terms of style, it is difficult to miss the Reebok Pump Omni Lite on the basketball court because it is still a head turner for a classic shoe. Use them in a few games for that needed wearing. Minor tearing and creasing would give the shoe the necessary edgy style on the court. The Reebok Pump Omni Lite runs true to size. The feet are kept secure through a Pump ball manual inflation system to ensure a perfect fit. Because of its historic basketball roots, it offers superb hold and support, even for occasional forays on the hard court. It is available in men’s sizes ranging from US size 5 to 13. In terms of features, the Reebok Pump Omni Lite has a HexRide cushioning technology with a visible hexagonal shaped air cushioning displayed at the bottom. The Omni Lite also has a molded sockliner and midsole and a Pump ball manual inflation system that helps keep the fit snug in place inside the shoe. The shoe also has a high abrasion rubber outsole delivering durability and traction. Among those who have been spotted wearing the Reebok Pump Omni Lite are Pete Wentz, Swizz Beatz, Baron Davis, Common, Affion Crocket, Trinidad James, Joe Budden, Future, DJ Envy and Kanye West. Wrestler John Cena was also seen wearing the Omni Lites in one match.